This week was the official end of my federal probation, after seven years of being under the control of the Department of Justice. This release marks the end of the Bidder 70 chapter of my life and feels like the beginning of a new chapter for my work. At this momentous turning point, I want to share this reflection on the direction of my activism and to ask for your support. A lot of my work still involves civil disobedience against the fossil fuel industry, such as the training and strategizing that I’ll be doing May 7-12th at the Keep It In the Ground action camp in Colorado. But I’m also engaging in a variety of efforts to deepen the spiritual resilience of all of us who do this critical work for climate justice. I’ve been trying to catalyze that conversation in faith communities, secular activist communities and with students and young people. 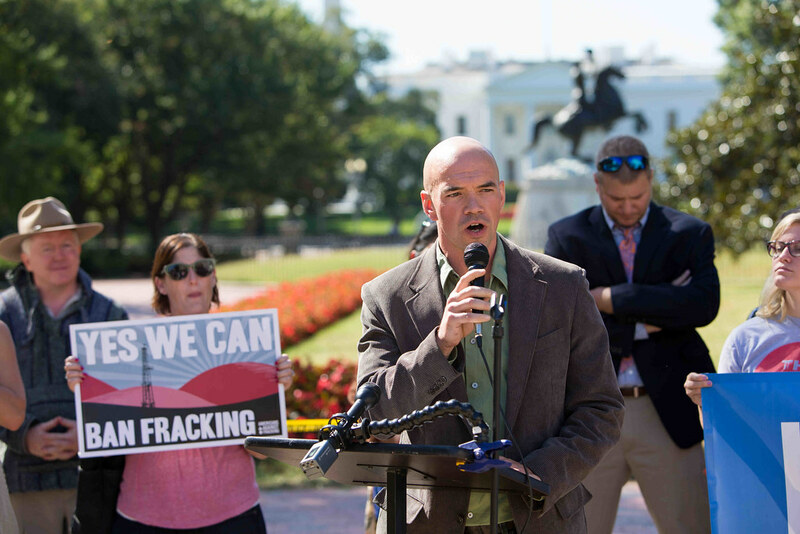 Tim DeChristopher speaks on behalf of the Climate Disobedience Center at the Keep It In the Ground press conference in front of the White House as a coalition of more than 400 organizations and leaders deliver a historic letter to the White House calling on President Obama to stop new federal fossil fuel leasing on public lands and oceans in the United States. I’ve found myself in a uniquely independent role in the climate movement, in part because of my unusual path to influence through an individual act of high-profile civil disobedience. I work with organizations and institutions like the Climate Disobedience Center, Unitarian Universalist churches, and the Keep It In the Ground campaign, but I’m not working for any of those entities. That unique role allows me to push the boundaries, experiment, take risks, and make mistakes. A lot of my efforts at empowering a culture of resilience and resistance don’t fit into traditional funding structures. Sometimes the truths I need to speak don’t have direct “deliverables” or “measurables,” but need to be spoken anyway. It has always been important for me to maintain my accountability to the broader climate movement, to my principles, and to future generations, rather than to funders. An independent network of sustainers allows me to pursue whatever opportunities or engagements I think are going to be effective at moving us toward a more just world, regardless of whether the communities I’m working with can afford to pay me. I know that requires a certain level of trust in my judgement and integrity, and I hope that after seven and a half years in the spotlight, I have built up enough folks who trust me that I can sustain my work. If you are one of those folks who trust me to do the work that I am called to do, please sign up here to pledge your support. Your donation will be considered a gift, and received with gratitude. It won’t be considered a purchase or investment to be received with obligations. I deeply appreciate any money you can donate, but not so much that I would prioritize the interests of those who give money over those who are just being born into a broken world. If you know of other folks who are familiar with my work and would be interested in supporting me, please share this post with them and encourage them to donate. Every bit of support helps. Most important is to know if you value my work enough to help fund it. If so, please become one of my monthly sustainers. Thanks for reading and for being a part of this journey with me. This post was adapted from my Friday email briefing for April 22, 2016. To receive weekly email updates on my work and activism subscribe here.